Ere the precious time is gone. Be ready for it, yes, indeed! "Procrastination is the thief of time, collar him." 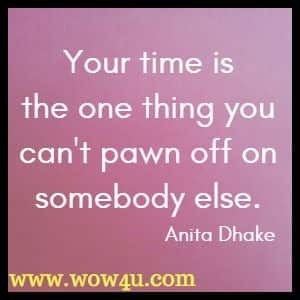 "Your time is the one thing you can't pawn off on somebody else. What do you want to be doing? Are you doing it?" God bids us do to-day. To meet a sister's need. It is not ours to choose. "When we spend our time looking at what other people do or what they have, we deprive ourselves of the opportunity to see our own value." If within our own homes we would use the same " specs "
I think we would find many more. Or astonished we'd be, never fear! So their own faults remain in the shade. That the same through the dark ones appear. With the dark for the much broader range. And good people lived everywhere. More Motivational Poems: . . . .